Summary: After South Sudan declared independence from Sudan last year, much of the border between the neighbors is still hotly disputed, with recent violent clashes around the Heglig oil field and other areas. Read on for a full list of Sudan and South Sudan's eight major border flashpoints. Border map of Sudan and South Sudan, showing disputed areas and fighting since the beginning of 2012. Aerial bombings and attacks by rebel groups not shown. My own work, using blank Sudan and South Sudan maps by NordNordWest / Wikipedia. License: CC BY-SA. Nearly one year after South Sudan separated from Sudan, the precise location of the border between the two countries has still not been agreed upon and demarcated (marked on the ground). An approximate border line has been drawn on the map following the route of an old internal boundary between the northern and southern regions of colonial Sudan - known as the "1956 border", for the last date it was in effect before Sudanese independence. But its implementation is so messy that the two sides can't even agree on how much is disputed, with Sudan claiming that 80% of the border has already been effectively agreed upon, while South Sudan says it's only 40%. Last month, tensions boiled over into a small border war centered on Heglig, a northern-administered oil town claimed by South Sudan. Fighting spread briefly to other border areas, and many locations in the south were bombed by Sudanese planes. The following article profiles eight hotly contested or widely acknowledged disputed areas along the border between Sudan and South Sudan. (Note on spellings: Many of these place names come from Arabic or other local languages, and do not have agreed-upon English spellings. Alternate spellings are indicated in parentheses). The small, remote oil town of Heglig, known as Panthou to South Sudan, is apparently located on northern Sudan's side of the 1956 border. However, older maps don't label the town at all, and until 2003 it was administered as part of Unity State in the Southern Sudan region. Then, just after the Sudan government and the future independent South had agreed not to share oil from north of the border, the government abruptly informed the southerners that Heglig in fact belonged to the north's Southern Kordofan state. The former Sudan's current administrative areas. Blue: South Sudan. Green: Sudan (darker green: states with active rebellions). Yellow: joint administration and U.N. peacekeeping force. Modified from this map by Wikimedia user Lokal_Profil (CC BY-SA 2.5). Minds in the south weren't changed so easily, and after two weeks of border clashes starting in late March of this year, South Sudan invaded Heglig. The southern government claimed they were only retaliating against earlier attacks by the north, but Sudan and the U.N. denounced it as an act of aggression. The South Sudanese army occupied Heglig from April 10-20, and advanced nearly as far as Kharasana (also Kersana, Karasana, Karasanah) before turning back - whether out of defeat or in order to stem international criticism is not clear. The front line has since moved back to Teshwin (also Tachiuen, Tishwin, Tashwin), an uninhabited spot on the 1956 border. Sudanese air strikes during the confrontation occurred deep within South Sudanese territory (PDF), including in Unity State's capital of Bentiu, as well as Panakuac (also Pan Akuach, Pana Kuach), a military position on the road to Teshwin. This is the largest of the regions disputed between Sudan and South Sudan, with its own confused history. 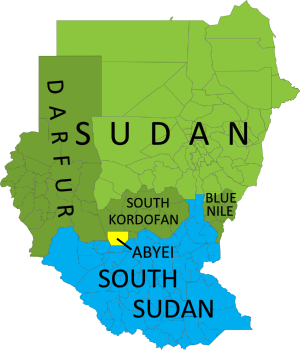 Sudan seems to have transferred the area from the south's Western Bahr el Ghazal state to the north's South Darfur state in 1960 - too late to make it part of the north under the 1956 borders. However, some documents suggest it may have already been transferred by the British in the 1930's (before 1956, making the transfer still valid today). In addition to the town of Kafia Kingi itself, the area also includes the copper mining town of Hofrat en Nahas (also Hufrat an Nuhas, Hufrat al Nahas) and the border town of Kafan Dabi (also Kafindabei, Kafn Dubai, Kafan Dibi), which was recently "recaptured" by the north. 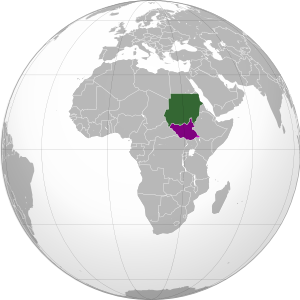 Location of Sudan (green) and South Sudan (purple) in Africa. Modified from this map (license: CC BY-SA). Located right on the north-south border, this town on the frontier of Unity State and South Kordofan rose briefly to prominence after South Sudan claimed Sudan occupied their territory there last December, eventually leading to a victorious southern campaign to recapture the town in February. Rebel groups in the north simultaneously claimed credit for the victory, reinforcing Sudan's accusation that the rebels are supported by the South Sudan government. Called "River of the Arabs" by the north, and the Kiir River by the South, this is a locally important waterway that intersects the Abyei Area after running somewhat north of the 1956 border for a few hundred kilometers through South Darfur state. However, locals insist that the river is the real border, though it is unclear whether the South Sudan government itself actually claims the south bank. During last month's outbreak of border warfare, fighting occurred in the riverside village of Kiir Adhem (also Kiir Adem, Kiir Adham), as well as a location known as Warguet, north of Aweil town in Northern Bahr el Ghazal state. This dispute arises from a history of multiple changes to the border between Renk County in the south's Upper Nile state and Jebeleyn (or Jabalain) County in the north's White Nile state. Although locals dispute the whole eastern half of the boundary between the two states, the governments of Sudan and South Sudan designated only a small area near the present-day border crossing of Jodha as a recognized territorial dispute. (Source: International Crisis Group report on Sudan north-south border.) During last month's widespread border conflict, fighting broke out in the nearby town of Kuek, though some sources claimed South Sudan's army faced an independent militia rather than the Sudanese Armed Forces. 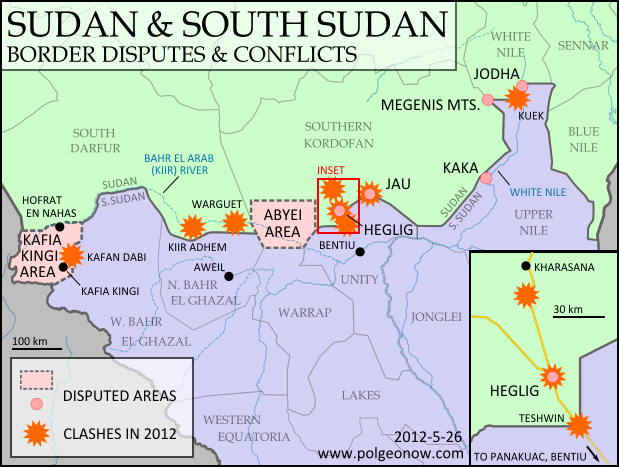 Situation Map: Sudan-South Sudan border areas (27 April, 2012) (PDF). U.N. Office for the Coordination of Humanitarian Affairs (OCHA). Policy Briefing: Sudan: Defining the North-South Border. International Crisis Group. Map of Southern Kordofan and Abyei. U.N. Cartographic Section. South Darfur Planning Map: All Settlements. Humanitarian Information Center for Darfur. Sudan: Population Movement. International Federation of Red Cross and Red Crescent Societies.